This page will set forth the entire body of work of Mary Stuart Masterson, including films, television, talking books, and voice-over narrations for television documentaries. The page will divide her different works into sections, each with the title of the work and a link that will provide additional details. 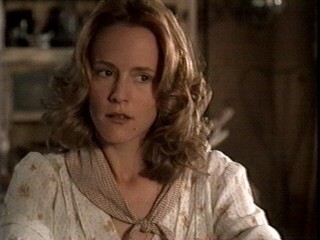 An actress since the age of seven, Mary Stuart Masterson has starred in 21 major and independent films. One has been completed, but not yet released. Once they are released to theaters, this list will be updated. In most of her work, Ms. Masterson fulfills the judgment of a British critic who described her as "a sensitive and engaging leading lady in films. " That's what they mean by "British Understatement." With the advent of Ms. Masterson now producing films, with "Last Man Running," directed by her former husband, Damon Santostefano, being the first, and also writing screenplays, this section will be separated into the different categories that reflect Mary Stuart Masterson's contributions to each film. CLICK ON A MOVIE TITLE AND GO TO A REVIEW AND OTHER STUFF! (2017) Season 14, Episode 16--"A Many Splendored Thing"
(2017) Season 14, Episode 17--"What Lies Above"
(2012) Touch--Season 1, Episode 13--"The Road Not Taken"
(2001) On the Edge: Anthology Movie for Showtime Cable Network: MSM Directed the short film "The Other Side"
"You want to have a reception here for what kind of Greek Wedding?"